After ‘Endless Summer’ released in 2016, Tim McEwan & Tyler Lyle aka ‘The Midnight’ return with a large-scale EP called ‘Nocturnal’. 7 tracks to listen at night during a road trip in a big bright city like Tokyo or Miami, especially after listening to the introduction of the first track ‘Shadows’. Indeed, the atmosphere is there from the first seconds with typcal Synthwave sounds, a slow and fresh rhythmic, the Thomas Edinger’s saxophone that captivates constantly and a chorus recalling the best of ‘Phil Collins’. Then comes ‘Crystalline’, a sweet and sensual track with singing and sax that always marry to perfection for a very successful result, we want more! Let’s come to ‘Collateral’, a totally instrumental track with a guitar solo which could make ‘Joe Satriani’ jealous, with an emotional saxophone part that reminiscent of ‘Careless Whisper’ from George Michael (1984). Then comes the fantastic ‘River of Darkness’ featuring the amazing ‘Timecop1983’. A real Synthpop gem mixing perfectly the romantic sax and the fabulous singing of ‘The Midnight’ with the fantastic melodies of ‘Jordy’ (TC83), effective and powerful are the key words. 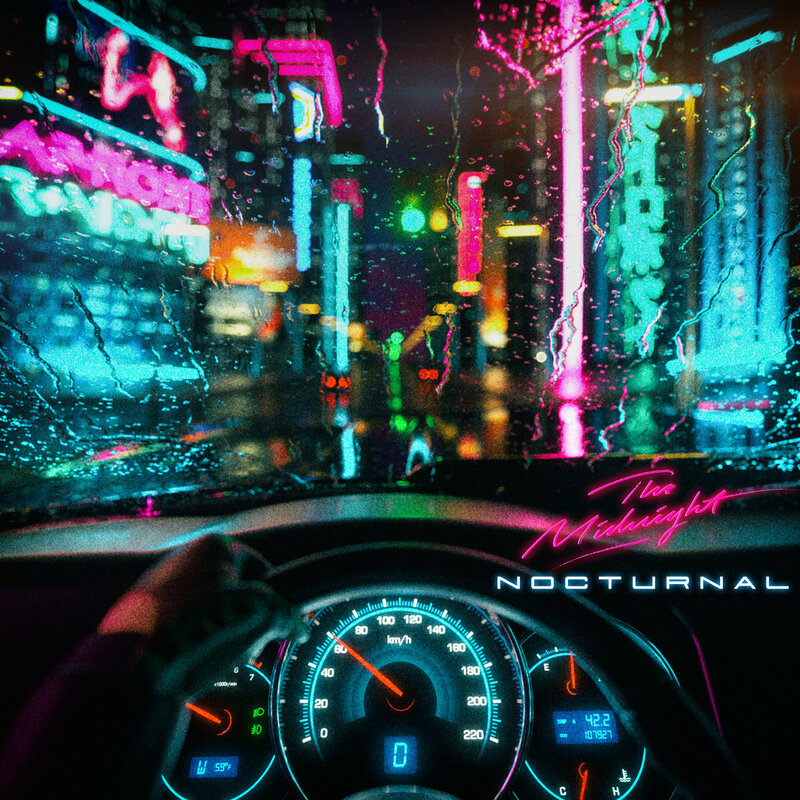 Now arrives the EP’s flagship track ‘Nocturnal’, with a nice homage to ‘Terminator’ from its first notes to send us in a 80s cosmos, a pure evasion to Synthwave’s universe. With melodies reminiscent of ‘Blade Runner’ or ‘Tron’ (the firsts) that we would have seen (listened) in ‘Stranger Things’ season 2, just that! For ‘Light Years’ it’s the talented singer Nikki Flores who shares her sublime voice with Tyler to make a perfect duet, complicit and complementary. All of this on a sweet and romantic music, as always, a full of love song. In tune with the title of the track, from the first notes ‘Tokyo Night Train’ takes us in a beautiful night trip to Asia, filled with beautiful dreams and happy elves, a perfect track to close this splendid EP. Note that the great cover was created by David Legnon. Good job guys! These lighter, longing elements perfectly augment the thrumming basslines, calling to mind the feeling of lost love. “Nocturnal” is, in short, a splendid mix of mystery, passion and heartache.